Learn about the temperament and personality of the Bichon Frise. Discover what he's like to live with, his traits and characteristics and how he generally behaves. And look at lots of Bichon Frise photos. The Bichon Frise is an incredibly cheerful little dog who loves to be the center of attention. He likes to think he runs the household, and will want to be at your heels or in your lap at all times. They are naturally gentle, intelligent, playful, and happy. They make a good family dog, but many breeders do not recommend they live in homes with small children, because the children could easily accidentally injure them. And if harassed by a child, a Bichon Frise will get snappy. They do, however, get along well with other household pets, as long as they get lots (and lots) of their human's attention. They do not do well being alone for hours at a time, and can start to chew at their own skin and fur out of distress. They can also bark out of boredom and loneliness, which will not necessarily endear him to your neighbors. Speaking of barking, the Bichon Frise is good at it, and will bark often. They have great hearing and will bark at everything. They do not need lots of exercise, but will require regular short walks. They are social dogs and like to get out and about and see people. The Bichon Frise does best with a loving, patient owner, as they are notoriously slow to housetrain. The Bichon Frise is moderately easy to train. He learns new commands at the average rate. He is neither difficult nor easy to train. 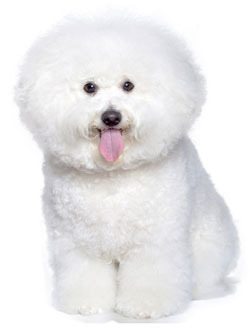 The Bichon Frise sheds practically no hair at all. You'll virtually never find a hair in your home!